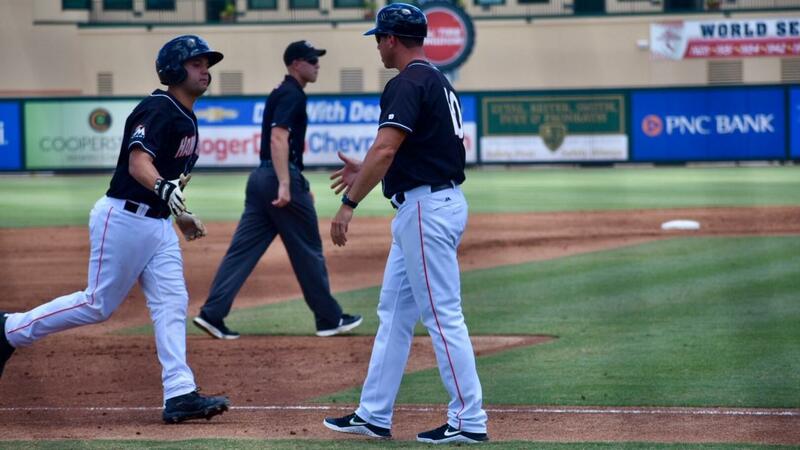 Jupiter got off to a quick start in Sundays 3-0 victory, as they scored all three runs in the second inning. The newest Hammerhead, Michael Hernandez had himself quite a day. The 23 year old catcher hit a two run homer in his first ever at bat in Single-A Advanced, he ended the day with one hit and two RBI and also caught a runner stealing. The only other run of the night came in the second inning as well, when Jhonny Santos sent home Riley Mahan from second base on a single to center field. Josh Roeder earned his fifth win of the season in the victory and now sits at 5-2 on the season. The starting pitcher stayed on the mound for seven innings and allowed just two hits. Out of the bullpen, Esmerling De La Rosa pitched one inning striking out two batters. Parker Bugg entered the game in the top of the ninth inning and recorded his first save of the season after closing out the game allowing no hits. The Jupiter bullpen had a fantastic outing allowing only three hits and no runs in the win. The Hammerheads host the Mets in a three game series starting Monday at 6:30 P.M. Tickets and more information can be found at Rogerdeanchevroletstadium.com/tickets-events.